A note on meat…. and a pudding! I am not one to vehemently advocate a particular ingredient over another. I am likely to be enthusiastic, yes, but I would never veer into any territory that resembles preaching. And there is one food topic I definitely won’t go near: the politics of meat. But mostly that is, of course, because I don’t need to. We all know the score: eat less of it and when you do, buy the good stuff. Organic, free range, steer clear of anything resembling a CAFO, so on and so forth. Nuff said. But the unavoidable issue comes down to money- the good stuff is pricey. And even if you don’t buy it as often, paying what sometimes amounts to double (I had a quick comparison on mysupermarket.co.uk) stings, especially in these cash-strapped times. I find the answer lies in going ahead and buying high quality meat, but the less popular cuts. I honestly can’t remember the last time I bought a chicken breast, for example. I find chicken thighs and legs are not only more flavoursome, they are generally less dry and more forgiving to cook with, not to mention a great deal cheaper. I also use lamb neck in my harira, and I’ll roast a piece of fashionable pork belly (by now ubiquitous on gastropub menus) and serve it with spicy plum sauce. I’m also looking forward to trying out recipes for ham hock and brisket. 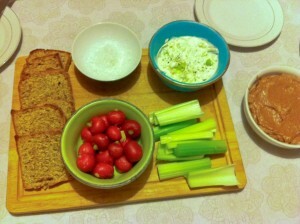 The other week we had our lovely newlywed friends, Pete and Anna, for dinner and I had a real craving for some pâté. I do on occasion order liver when eating out as I like the taste, however, it is quite rich and as such not something I would necessarily buy and cook a whole packet of. But for a deep and smooth pâté, I made an exception and headed to the liver section of the meat aisle. It took me a half hour to find. Who would have known chicken liver is most logically filed next to minced lamb? In any case, when I finally found it I was delighted by how cheap the good quality stuff was- for a measly £2, I got twice the amount I needed. Melt 25g of the butter in a large frying pan. Add the chicken livers, bay leaf, thyme and season with salt and pepper. Fry the livers for about 3 minutes until they are golden on both sides but still pink the middle- do feel free to check by cutting the livers in half, it doesn’t matter as they are all going to be whizzed up into a paté anyway. Discard the herbs and pour the livers and any juices from the pan into a blender. Melt another knob of butter in the pan and add the shallot and garlic, sweating until cooked through. Add the booze and simmer, enjoying the wonderful fumes, until almost completely dissolved. Tip all this into the blender with the livers and purée until smooth. Add the crème fraiche and blend again, making sure that the mixture is well-incorporated. At this point, add the remaining butter and a good grating of nutmeg. Continue to blend until you have a thick, paté-like consistency. Spoon the parfait into a bowl and leave in the fridge until required. It will keep for a couple of days but may need 10 min or so out of the fridge before serving, just to soften a bit. Serve with sourdough bread, radishes, celery, red onion marmalade. For this starter, I also made a goats cheese dip by mashing the cheese with some garlic, sea salt and mixing with crème fraiche and chopped spring onions, which provided a fresh counterpart to the meaty density of the parfait. 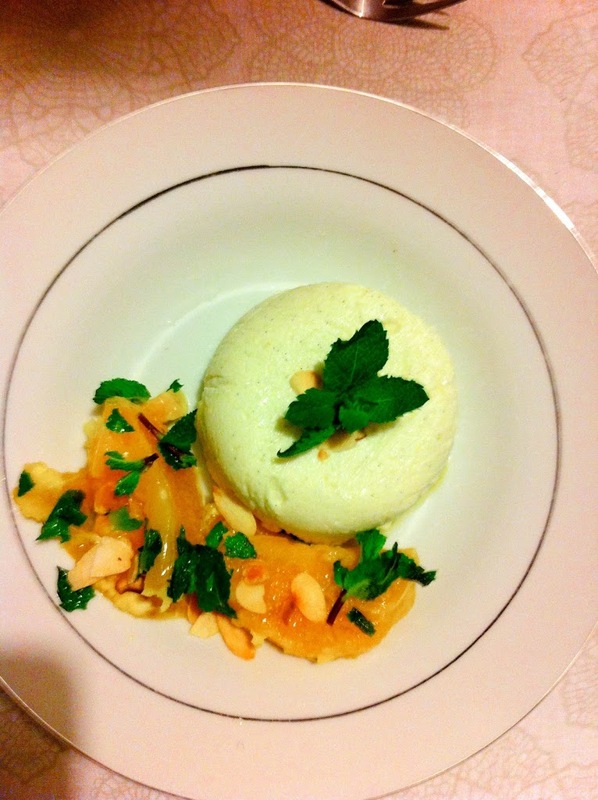 For a pud, I wanted something sweet and creamy and managed to dig out an old favourite recipe for Panna Cotta. This is a honey and almond flavoured one that is at once velvety and grainy, with a nutty bite from the ground almonds that gives it a bit more substance. It’s one of those puddings that never fails to impress, but is extremely easy to make. The only tricky part is getting your gelatin just right- it needs to have dissolved completely. If you don’t like the idea of using gelatin, agar-agar flakes are a seaweed-derived substitute you can find in most health food shops and even larger supermarkets. In a large bowl, combine cream, yoghurt and honey, mixing until smooth before adding the ground almonds. Cut your vanilla pod in half length ways and then scrape out all the seeds. Add to the mixture. Prepare your gelatin or agar-agar flakes, following the instructions on the packet. If you aren’t quite sure, add about 3 tablespoons warm water to a large bowl, add the gelatin and stir to dissolve before leaving to cool. Make sure to add the gelatin to the liquid and not the other way around and that all the gelatin has dissolved completely. Otherwise you may end up with strings of squid-like rubber in your pudding. Which is rather unpleasant. Once you’ve prepared the gelatinous water and are sure it has completely dissolved, add to the creamy mixture. Divide this into your prepared ramekins and chill for at least 4 hours until set. To serve, turn out onto plates, removing the cling film. I accompanied mine with a simple orange, mint and toasted flaked almond fruit salad, but you could just as easily serve it with other fruits- summer berries would work particularly well. « Those pickles and preserves- things for jars.